So, if you read my Essen recap from this year, you’ll already know the story about this game – The Football Game was the unfortunate winner of the “my bags are already stuffed full and I don’t have room for this awesome looking game” sweepstakes. I stumbled into the booth late Saturday morning and got a quick demo from one of the designers. I was pretty sure that this was a game that I would have to try, and one that I would have to try with my kids. In short, in The Football Game, each player takes control of a football club (that’s soccer for us Yanks), and hires players and manager, and tries to exceed their preseason expectations. The three and four player game is played over six rounds, with three scorings along the way. 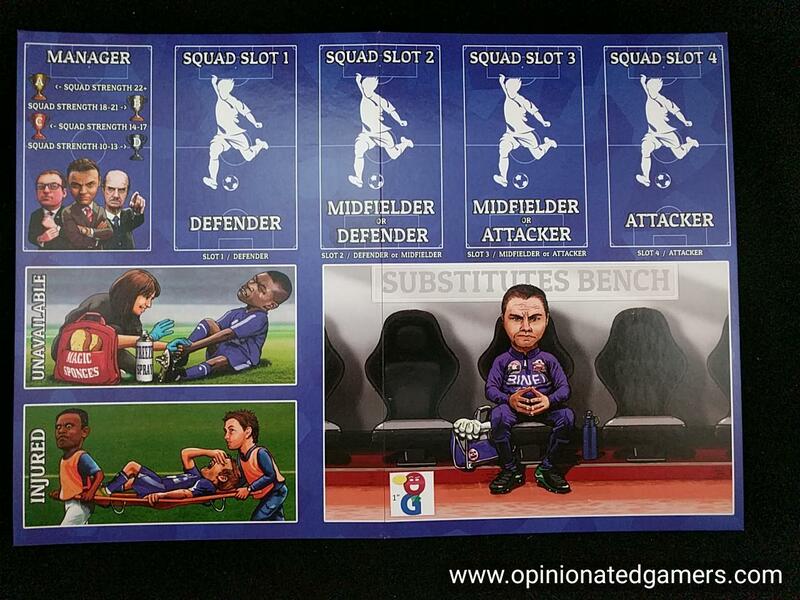 The player’s football club is represented by his player board – there is space for the (current) manager card in the corner, and then a row along the top where you can place your four starting players. Player cards come in four different colors (Red, blue, yellow and black) and they can have numerical values from 1 to 5. Beneath this row is the substitutes bench (for active players that are not starting), the unavailable area (for minor knocks) as well as the injured area (for more serious injuries). There is only a small standings board- known as the League Table. There are 11 different steps on this table. Players place their team marker on this chart at the start of the game based on their initial team strength and will move it up and down the table based on the results as the game plays out. 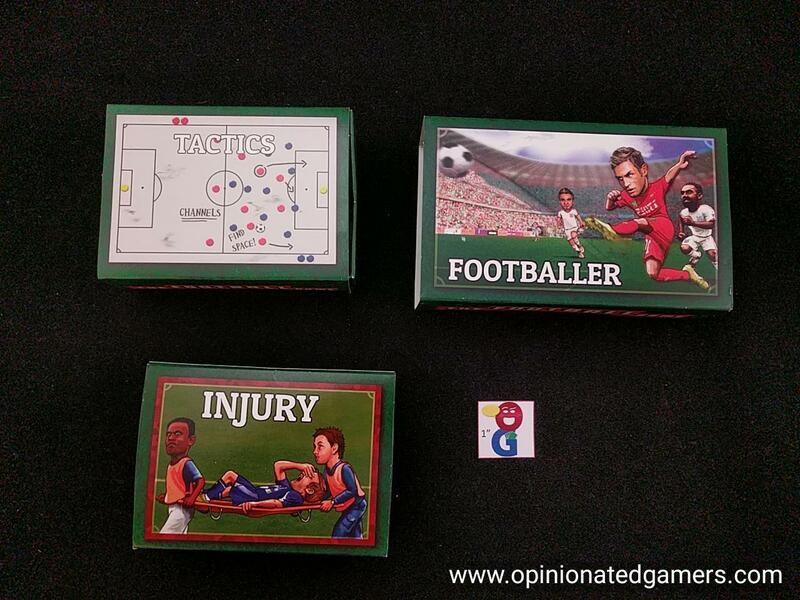 The remainder of the game is found in the multiple decks of cards: Footballers, Managers, Injuries, Events and Tactics. At the start of the game, each player takes their club mat and then is dealt 7 Footballer cards. The numbers on these initial cards are summed and this total will determine the “Class” of your club – Class A for the highest totals down to Class D for the worst. You now place your team marker on the table onto the corresponding space for your Class of team. You will get a scoring card which corresponds to your Class. This card shows your pre-season expectations, and your score in the game is based on how well you exceed those expectations. The player with the highest total sum of footballers will be the start player. The game recommends that you change seating order so that the players are in highest to lowest sum going clockwise around the table. 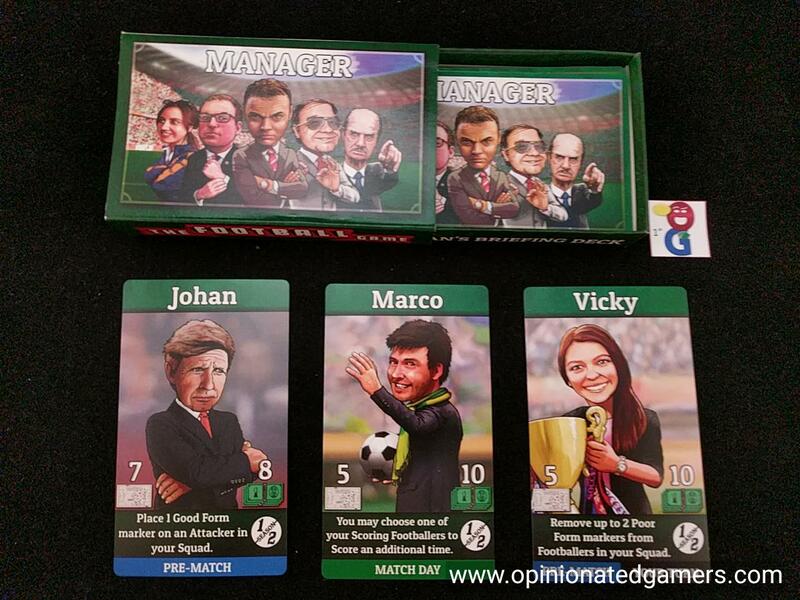 Each player is also dealt 2 Manager cards to look at – one is kept and placed on the team board and the other is discarded. Each player gets a starting amount of money equal to the budget on their chosen Manager card. The bottom of each Manager card also has a unique ability on it – this can be used once per half-season. 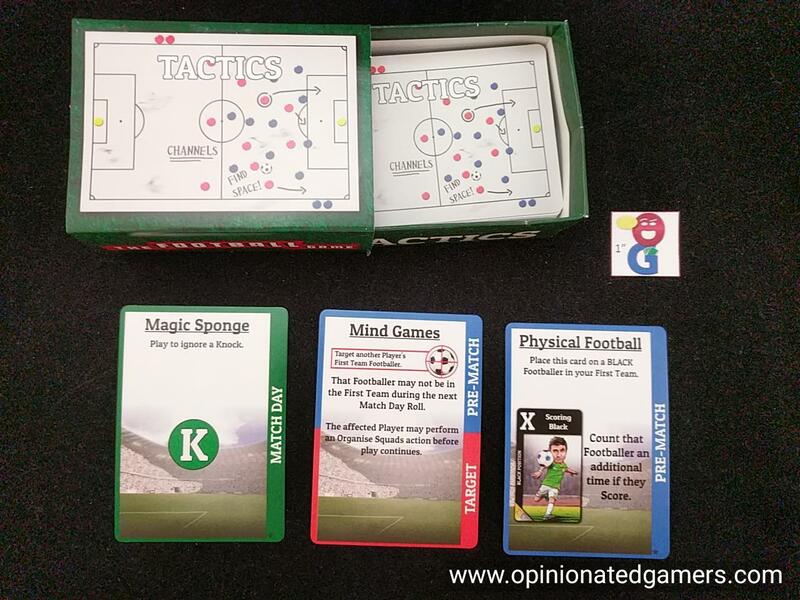 Each team also gets a number of Tactics cards as stated on their Manager card – though this number is modified based on the Team Class (see your scoring card for the appropriate modifier). These Tactics cards can be used at different points in the game to give your team an edge or perhaps throw a roadblock in front of one of your opponents. A transfer market is set up on the table – the top 5 cards from the Footballer deck are placed face up where everyone can see them. The flow of the game is fairly simple. There are six rounds in a full game, and in each round – each player will have one chance to be the active player. 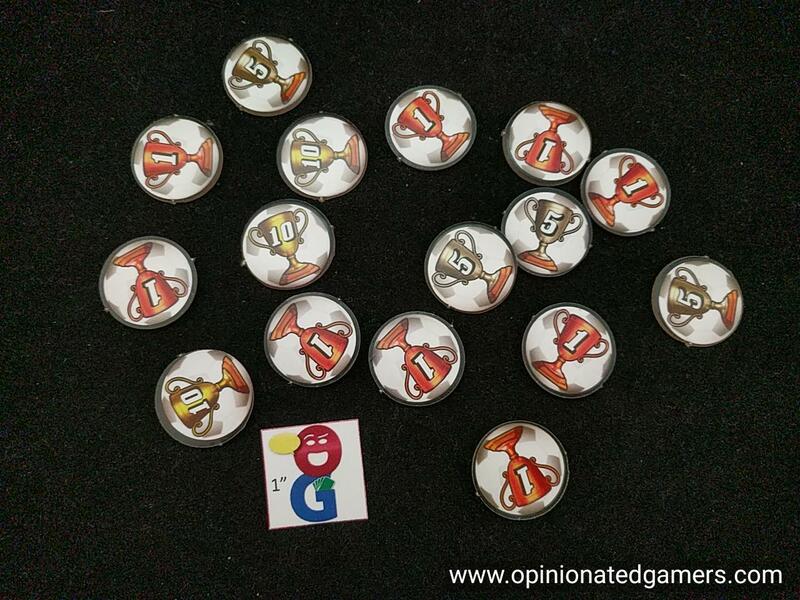 However, at the end of each player turn, the dice will be rolled and ALL players will score for the turn. A turn starts with the Pre-Match phase. In this phase, all players determine their lineup for this particular turn. Again, there are four slots on your team. Defenders can only be played in slots 1 or 2, Midfielders can only go in slots 2 or 3, and Attackers are limited to slots 3 and 4. You must fill all spots if possible. All unchosen players go into your Substitutes Bench area. While this is going on, the Active player alone has the following steps to take. First, they get to return any players from their Unavailable area into their active area – these players can be chosen for the current lineup. 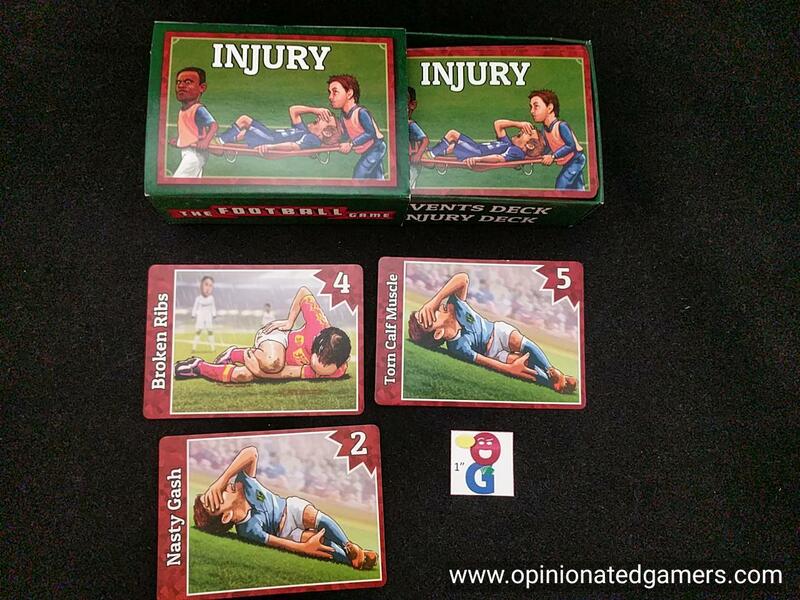 Additionally, if there are any injured players, the active player rolls the injury die for each card. If the number of bandages meets or equals the number on the particular injury card – then the player is healed and is active again. If the roll fails, a clip is placed on the player which gives a +1 towards the next roll. The active player may also enter the Transfer market. Each player has a buy and a sell rating in the lower left corner of the card. You are free to sell any players – if so, you collect the money on the card and then discard the Footballer card. If you want to buy a player, choose one from the Transfer market, add it to your active area and pay the buy cost on that card. Note that the Transfer market does not automatically refill! Once in your turn, you can choose to Scout by paying 1 buck – this allows you to discard the current Transfer Market and deal out 5 new Footballer cards. You can buy and sell as many players as you like, but you may only Scout once. The active player may also sack his Manager once per game, and it must be done while he is the active player. You discard your whole hand of Tactics cards and draw a new hand based on your Manager’s new rating; note that you do NOT get a new budget of money though. If you want, you can also simply re-draw your hand of Tactics cards, but only if you have 4 or fewer. Discards the whole hand and drawn the number discarded PLUS one. 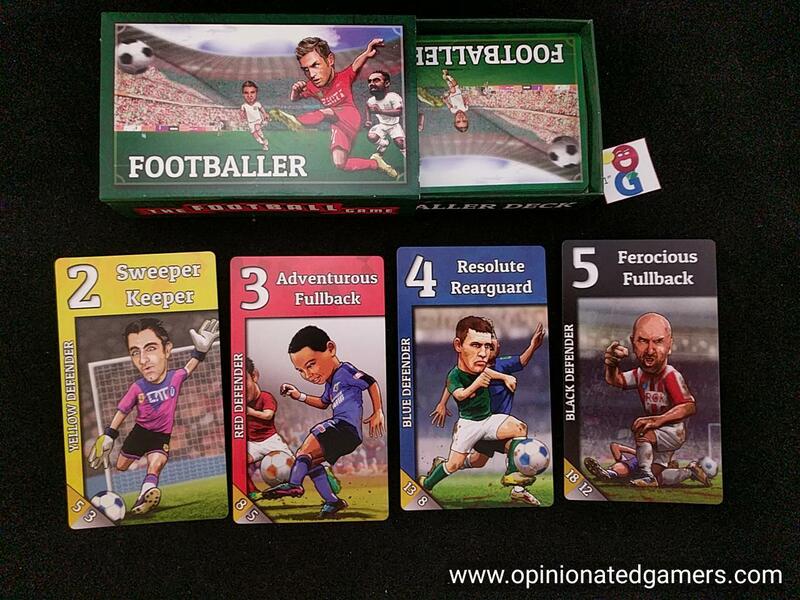 Once all those actions are complete, the active player makes his lineup selection and places his four chosen Footballers onto the top row of his board. He announces that his lineup is “Set”, and he may not change them any further this turn. The other players in clockwise order now must make the same final decision on their lineup. Then, starting again with the active player and going clockwise, each player has the option to play as many Tactics cards which are labeled for this Pre-Match phase. Some of these cards may affect your own team, some may say “Target” which means that you choose the target of that particular card – this will usually be your opponent. If your manager has a Pre-Match ability, it could also be triggered now. The turn now moves into the Match Phase. The active player picks up the 2 Match Dice (d6) as well as the 2 Event/Injury/Knock (EIK) d12 dice and rolls them. 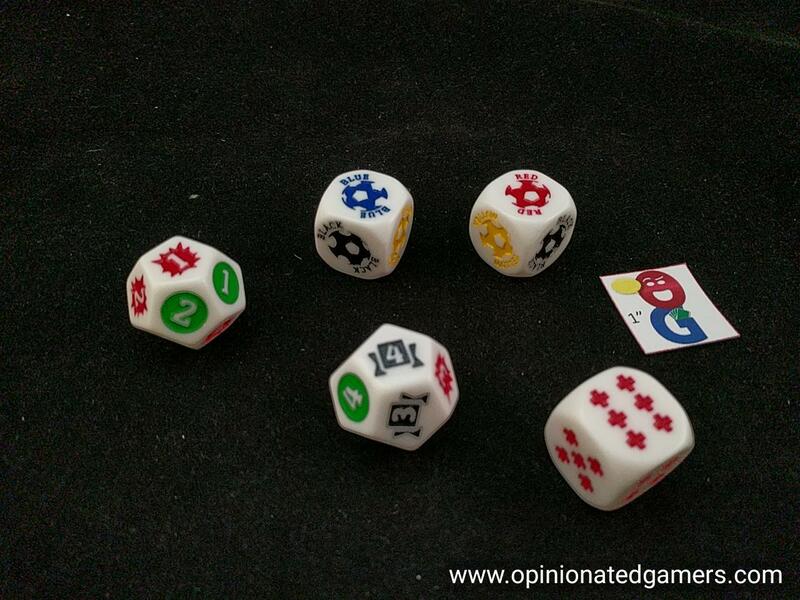 If the same color is rolled on the two Match Dice, each player draws a Tactics card as a bonus. Each player now calculates their Match score for the turn. Each player whose background color is seen on the 2 Match Dice will score (for each time their color is shown). The points scored are equal to the large base value found in the upper left corner. The player may also have Form markers on them which will modify their score by +1 or -1 per marker. Finally, players can choose (in clockwise order) to play Tactics cards or use their Manager ability to improve their own score or perhaps lower the score of a targeted opponent. 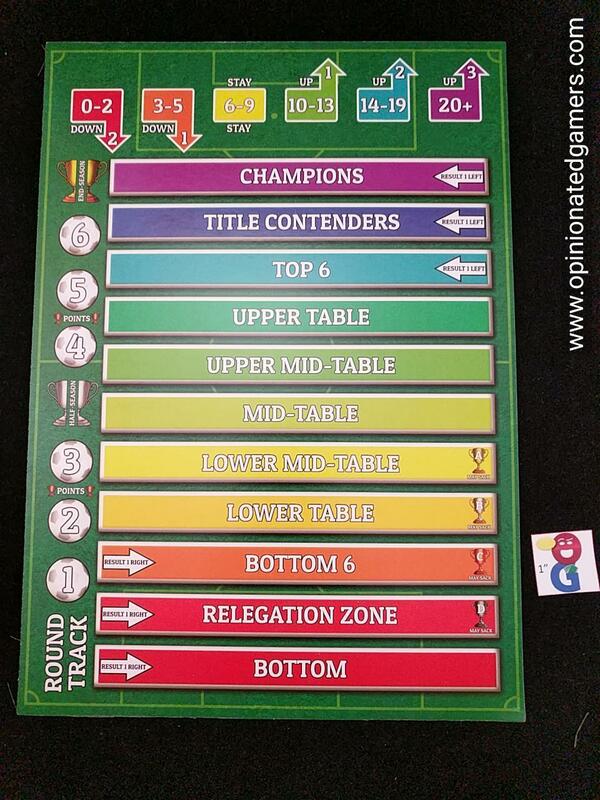 Don’t forget to also resolve any Pre-Match tactics cards that were played in the previous phase. Tally up all the different scores and modifiers to come up with your final Match Score for the turn. Now, each team adjusts its ranking on the central scoring table. At the top, you will see how different Match Scores affect the standings. For instance, if your Match score is between 3 and 5, you will move down one step, but if your match score is 20 or more, you will move up three steps. Furthermore, check to see if your current standing affects your movement. If you are at the bottom, you move based on the result block one to the right of what you actually score. If you are in the top 3 rungs, you consider the movement based on one space to the left of what you actually score – you know, because it’s hard to stay on top! The active player now resolves the EIK dice – all other players are not affected at all by these. These dice are always resolved in the same order: Event (black), Injury (Red), Knock (Green). Each of these colors is numbered from 1-4, and the number shown on the die corresponds to a Footballer in the matching numerical position in your lineup. This ends a player turn, and the next player clockwise in order gets to be the new Active player. When all players have had a chance to be the Active player, the round ends. The Round Marker is advanced one space, and if it is the end of Round 2, 4, or 6 – there is a scoring phase. Each player refers to their Class Card that they got at the start of the game, and there is a chart which tells you how many points you score based on the round and your position on the table. In general, higher class teams need to be higher on the table to score the same points as a lower class team – because, after all, the Class A team is expected to do much better than the lowest Class D team. The other thing that happens at the end of a round is the Half-Season recharge – this would be at the end of Round 3. Discard any half-season tokens on Manager cards – this means you are able to use the action again. The current transfer market is discarded and 5 new Footballers are put on display. 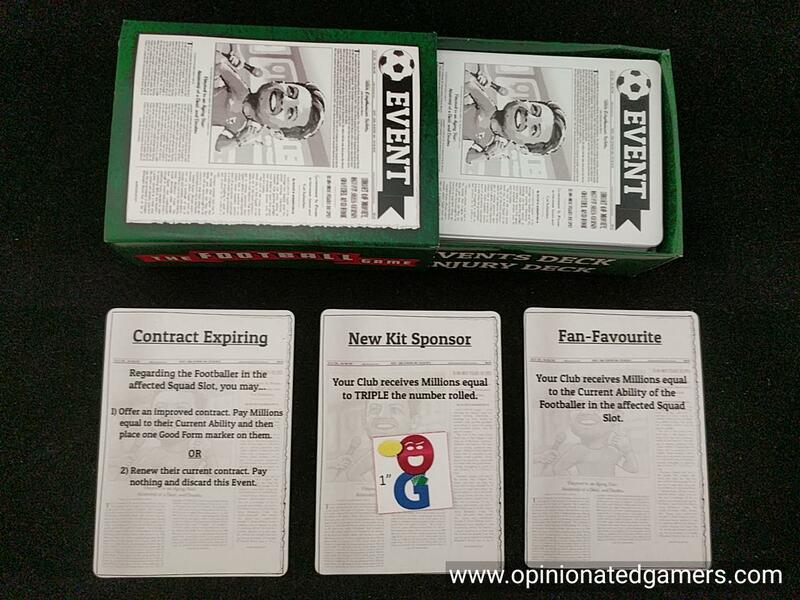 Each player draws money equal to their current Manager’s budget rating, and each player also draws new Tactics cards equal to their Manager’s tactic rating as well as the modifier based on their Class card. At the end of the game – player have all the points that they have scored in the three scoring rounds. Then, you get 1VP per 10 bucks left over. Finally, teams lose 2VP for each player less than 7 that they have at the end of the game. The player with the most points wins. But, that being said, you do get the ups and downs of following a squad for the whole season. Unless you’re hoping to be Celtic in Scotland; you’re likely going to have to expect a few bad results along the way to the end of the season… And this game really does give you that feeling of excitement. As I mentioned, there is a bunch of ups and downs with each roll – you can see your team move up and down the table with each turn. But, in the end, your position really only matters at the start of the game (to determine your team’s Class for the whole game) and then at the three scoring rounds. So, figuring out how to manage the rise and fall of the team to time it at the right moment is important. Though all teams want to be at the top of the table at the end of the game, the position shift that the top three spaces have to endure make it hard to stay at the top. A big part of your success will come from the Tactics cards. Higher class teams will end up with more Tactics cards, but that’s OK – because the game will also expect those teams to have better results. You’ll have a fairly limited number of cards in the game, so you can’t play as many as you want at every opportunity. You’ll have to wait for the right time – or you might have to wait for the right dice roll. You can get up to two large recharges to your Tactics hand; one at the mid-season break and one if you elect to take your once-a-game chance to fire your Manager. You’ll also get an extra card each time that the 2 player dice roll the same color, but this doesn’t seem to happen a lot in our games. You will also have to manage your team roster. The biggest force on your roster is the EIK dice roll on your active turn. Getting an injury to your star player can be disastrous. It is quite likely that injuries sustained could last over half of the game – which also means that injuries after the mid-season break might never be healed! The easiest way to avoid this is to play a weaker lineup on your Active turn as this is the only dice roll during a round where you’re at risk of injury. This, does of course mean that you’ll likely have your worst performance of the round on your active turn, but at least your lesser players were the one’s put at risk. To give yourself enough options, you’ll need to go through the transfer market and buy and sell players to meet your strategy. You may have a tactics card that rewards you for certain combinations of players scoring on the same turn – it’s easier to make this happen if you have the same color player in those slots. There are some turns where you may want to play all four colors to ensure that you have a guarantee of some scoring, while there may be others where you want to gamble on fewer colors hoping for a big payoff if the dice go your way. So, the big part of the manager’s strategy is choosing players and trying to find the right time to play the right Tactics cards. But, in the end, lady luck plays a large roll – because it definitely comes down to the dice. If you don’t see your player colors, you’ll not score. If you have bad luck with the EIK dice, you’ll be handicapped with players being out for one round or more. There’s also a bit of luck in the event cards, as some can be good and some can be bad. It all depends what you flip up… For me, that’s part of sport – and the unpredictability feels very much like the game itself; after all, the teams still play the games. The results don’t always follow the pre-match predictions. But, if you’re going to enjoy this game, you have to be ready for swings in fortune that rely on a single roll of the dice or flip of a card. I’d also make sure that you wear some thicker skin as there is the potential for some take-that play with the targeted Tactics and Event cards. Sure, usually these cards will be played against the current leader – whether that be the player with the most VPs at the time or the player that might be at the top of the table right now – but it doesn’t have to be, and there is certainly the possibility for some dogpiling on a less fortunate squad. I don’t really know how this would affect the balance, but there are enough cards in the deck to possibly try a game without the Targeted cards if this sort of thing bothered you. The game moves along fairly quickly as each turn only takes a few minutes, and players are active in each turn as they are setting lineups and calculating scores after the dice roll – so there is constant engagement. As the scores for each succeeding scoring round increase, the game tends to come to a crescendo finish. We have yet to have a game that had a runaway winner. In fact, in most games, the game was still in doubt up to the final turn. On most normal turns, you’ll probably just set your best lineup and not worry about the other players. However, in the final turn, you may end up with a different strategy. Depending on where you stand, you might try to match the colors of an opponent (so that they can’t gain as much ground on you) or you might try to play different colors entirely (so that if you get a good roll, you’ll score points and they won’t score any). As players have to set their lineup in turn order, you may be able to use this to your advantage in that final round. Overall, I’ve enjoyed this game a lot. I’ve had a great time playing it with my two soccer-playing boys, and they love it as well. I’ve also played it with non-athletic gamer friends, and they’ve been able to learn the game and have enjoyed it as well. 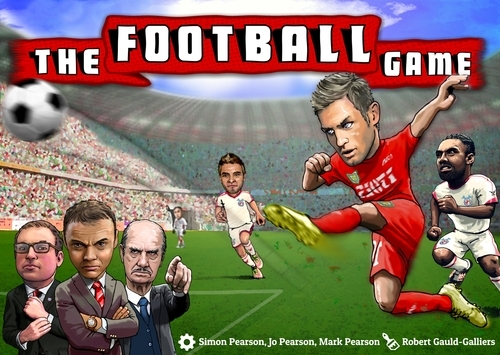 I think that this is a good sign that the Football Game could have universal appeal to gamers, and not just to the cross section of gamers who happen to also like soccer. It’s definitely on the lighter end, with lots of luck and a little bit of take-that, but it is an fully enjoyable hour long experience. In our household, we often spend most of Boxing Day watching the full slate of games from the Premiership, but this year, who knows – maybe we’ll get in a few games of The Football Game instead.